In 2008, I wanted to start an award that would provide some motivation to work hard while facilitating some unity within the team. I stole the basis of this award from the football coach at my high school. 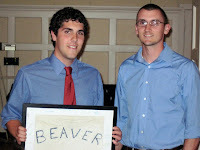 The Beaver Award, as he called it, went to an athlete who he thought worked the hardest the previous week. He gave the athlete a stuffed animal beaver and the recipient had to have the beaver on them at all times at school...class, lunch, wherever. The next week, coach gave the award to someone else and they repeated the process. For MSU Rowing, I decided against the stuffed animal and went with a white t-shirt instead with "BEAVER" written on the back with a magic marker. I presented the concept to the team with a story about how beavers, as animals, are hard working, diligent, pack animals who would do everything for others first. The recipient must wear the shirt at practice at all times, and the shirt could never be washed for the whole spring semester. 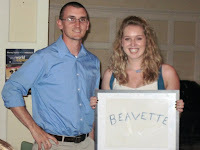 Come the end of the semester, I framed the shirt and gave it out at the banquet to the semester's "ultimate beaver", or hardest worker, who could keep it forever. Memories. The Beaver Award is still in effect and it has been joined now (since the girls are club with the boys) with the Beavette Award. The award has not been popular by any means with the athletes. These shirts can get pretty nasty. Blisters, blood, sweat, toxic water (see Oak Ridge TN Melton Lake), and sometimes puke are embraced by the shirt. It is with us at all practices and travels with us to regattas where I hang it from the trailer is proud fashion. Although it gets pretty unbearable to wear, it represents all the work and dedication each teammate puts into the semester which I think is pretty cool.